The growing US solar market has just had its biggest year ever. 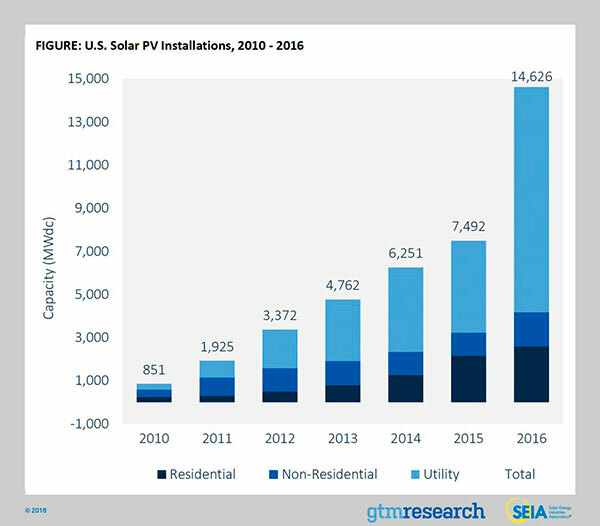 In 2016, the US market almost doubled its previous annual record for newly installed capacity, with a whopping 14,626 megawatts of solar PV (solar panels) installed within the year, GTM has reported. The growth is stunning, and it means that the United States now has a cumulative solar capacity of over 40 gigawatts, with a total of 1.3 million solar PV installations. Moreover, with a population of nearly 320 million, the US solar market still has a great deal of upside. The 2016 result is a 95% rise from the previous record of 7,493 megawatts installed in 2015. The figures come from a preview of the upcoming US Solar Market Insight report, put together by GTM Research and the Solar Energy Industries Association (SEIA). In the United States, solar ranked as the number one source of new electricity generating capacity on a yearly basis. Taking into account all fuel types, solar made up an impressive 39% of new capacity in 2016. In terms of jobs, this amounts to a 25% increase on the previous year, or 51,000 jobs, totalling 260,000 Americans now employed by the solar industry. The huge growth in solar was spread across the board, rather than being concentrated in a few of the sunnier states. A record 22 US states added over 100 megawatts each. What stands out in the figures, is the growth in utility-scale solar, which grew a massive 145% from the previous year. Community solar also added over 200 megawatts, led by growth in Massachusetts and Minnesota. Notably, non-residential growth in solar exceeded residential growth for the first time, accounting for 2,583 megawatts. Residential solar grew by 19% year-on-year. While California’s residential solar market appears to be levelling out, other states such as Maryland are experiencing increasing growth. It makes you wonder why so many are trying to save coal – see this – http://www.eia.gov/coal/annual/ – employment is around 25% of solar. It definitely seems that fossil fuel interests, along with certain politicians, trying to resuscitate the declining coal industry will not work. Renewable energy, and especially solar, is fast becoming the cheapest way of producing energy around the world. There are so many new jobs to go with that, too.